The ultimate email productivity tool. Send later, track responses, and use AI to write better emails. The ultimate email productivity tool. Send later, track responses, use AI to write better emails, and free yourself from email interruptions. Boomerang allows you to schedule messages to be sent or returned at a later date. Write a message now, send it whenever, even if you're not online. 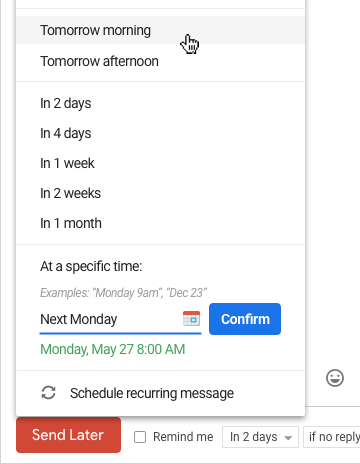 Track messages to make sure you hear back, and schedule reminders right inside Gmail™. Know whether your email got read with cross-platform read receipts. Free yourself from constant interruptions using Inbox Pause, while still getting notified about the emails that matter. Millions of Gmail™ and G Suite™ users count on Boomerang for easy, integrated scheduled email sending and reminders. The service allows you to schedule emails to automatically send in the future, so you can write an email now, and the service will send it tomorrow morning at 6 AM, or next week while you’re at the beach, without you needing to be online. Boomerang also helps you to postpone (“snooze”) incoming emails, by making them disappear from your Inbox into a folder or label, then bringing them back to the top of the message list at the specified time. It helps you keep your Inbox clean, without losing track of important messages. Boomerang is also the only reminder service that can alert you if you do not get a reply to a message. Boomerang’s latest productivity feature, Inbox Pause, helps you get focused by temporarily delaying the arrival of messages to your Inbox. This discussion is only about Boomerang for Gmail for Chrome and the Boomerang for Gmail for Chrome package. If you have feedback for Chocolatey, please contact the google group. Tell us what you love about the package or Boomerang for Gmail for Chrome, or tell us what needs improvement. Deployed from e27d7a207f. You are on web.2. UTC time is currently 26 Apr 2019 04:46:38 +00:00.